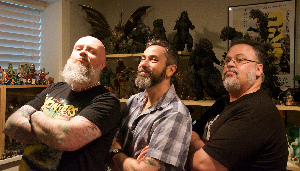 Kyle and Jeff sit down with Godzilla fan & Hail To The King photographer, David Eric Dopko. Initially, I was planning on the first episode of the month being a semi-detailed recap of the documentary filming and recent visit to the land of the rising sun, but there were some serious scheduling conflicts and I had to head east to help my friend and constant podcast voice, Martin, get hitched to his lovely lady. Big congrats to them, by the way! ‘Twas a lovely wedding. Thankfully I have a number of backlogged interviews and this one was recorded in March of this year, during the weekend of Emerald City Comic Con. Meet David Eric Dopko, a good friend of mine living in Seattle, Washington. In addition to being a talented photographer, enthusiastic traveler and lover of Japanese culture, he’s a massive Godzilla fan. Because of those reasons, I chose him to be my behind-the-scenes photographer for the Hail To The King documentary that we shot in August. I loved the conversation that we recorded at his house in March. I truly hope you enjoy listening to this bonus episode and getting to know David. Make sure to check out his articles in Famous Monsters Magazine about collecting Godzilla toys. Also, if you haven’t seen the Kaijucast Video Transmission with David talking about X-Plus, remedy that. *Please make sure to check out Keith Foster’s Kodoja: A Graphic Novel With A Soundtrack kickstarter campaign. I’m a big fan of this comic/music combo and think the world needs to know about it. **Please come to our GODZILLA VS. EVERYTHING panel at Rose City Comic Con! It will be at 11:00am on Saturday, September 20th in Panel Room 3 at the Oregon Convention Center in Portland, Oregon. It’s going to be awesome!